1. The henna in the Khadi henna and rosemary oil makes hair soft, lustrous, and manageable. A unique ayurvedic blend infused with natural extracts of powerful hair care herbs like Shikakai, Brahmi, Amla, Henna, Sugandhabala, kapoorkachari, Nagarmotha, Harad and Red Sandal that effectively controls dandruff, stops premature hair fall and thinning of hair. With immense market knowledge, we have been able to provide optimum quality Bhringraj Hair Oil. Khadi Herbal hair oil anti-bacterial and Anti-oxidant, enhances new hair growth, provides color restoration reduces inflammation and rich and vibrant tresses. Our herbal hair oil is a superior quality product which is manufactured with the use of best quality ingredients. The herbal hair oil is made in the controlled conditions of temperature and is completely safe. We at vedic kaya have developed this ayurvedic hair oil with great care in selecting the rarest herbs as per the ancient formula handed over by generations. We are ranked on top by offering the best quality of Khadi Hair Oil, which is known for its remarkable finish and quality. We are engaged in offering Khadi Herbal Hair Oil. 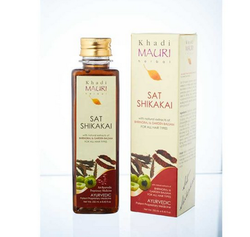 We are engaged in offering Hair Oil Kesh Kalp, which is formulated using high quality natural herbs under the brand name Khadi. This hair oil if regularly used maintains the fineness, texture and luster of the hair for longer period of time.